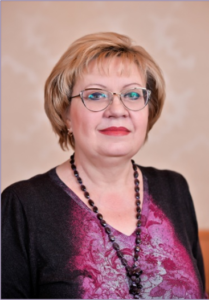 Head of the laboratory is Nemtseva Nataliya Vyacheslavovna, M.D., professor, the author of 225 scientific works, including 4 monographs, holder of 16 Author’s Certificates and patents of the Russian Federation, a laureate of the Russian Federation Government Award for Science and Technology (2010). Research interests: natural microbial communities, ecological interrelations of microorganisms, micro-ecological monitoring. symbiotic interrelations between eukaryotes and prokaryotes in natural communities in water reservoirs with different levels of mineralization. Hydrobionts community has been studied according to associative symbiosis concept – the universal biological phenomena of cohabitation of various microorganisms. Novel methods of ecological condition evaluation of natural water biocenoses and sanitary quality of water have been developed on the basis of symbiological approach. The developed methods have been introduced in the system of biomonitoring and have been used in the evaluation of sustainable ecological and economical development on the territories of the Volga basin. Prototrophic and phototrophic microorganisms with certain biotechnological potential as sources of biologically active substances have been isolated from water reservoirs with different mineralization levels.